Malachite is a green copper carbonate mineral. Malachite is used as a source of copper and as a gemstone. It often occurs with azurite in copper deposits. Malachite often has distinctive concentric bands in varying shades of green, which make it an interesting gemstone. The history of malachite goes back to the ancient Egyptians, Greeks and Romans, who used malachite to make jewelry and amulets, and ground it into powder to make eyeshadow. Malachite has also been used as the pigment in green paints. Malachite was found mostly in Russia, but mines there have been completely stripped and it is now most commonly mined in Zaire, Australia, Chile, Namibia, Zimbabwe and Arizona. Malachite is the stone of abundance, used in money magic and kept in wallets and cash registers to help attract money. It is also helps heal shyness, aids in stage fright and helps with non-verbal communication. It can be used to help improves posture and stimulate transformation. 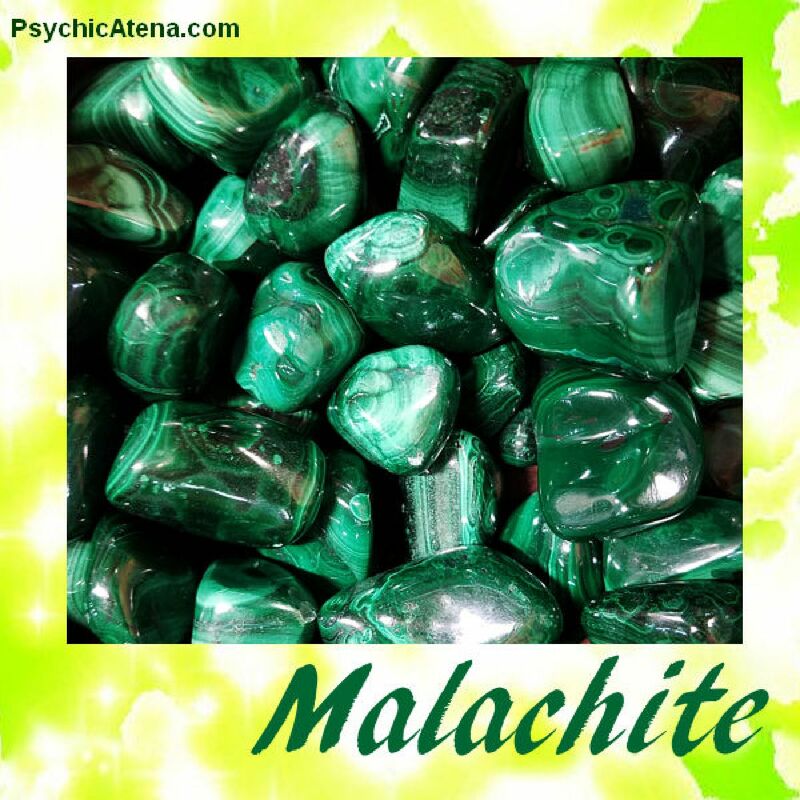 Wearing malachite is energetically conducive and grounding. It helps in transmitting of knowledge and wisdom from spirit guides and ancestors directly to the subconscious mind, which is useful also in healing karmic debt and releasing of bad karma. It also helps create strong blocks to negative entities and people, so it is often worn for protection. Malachite inspires hope, abundance, material gain, helps alleviate shyness and promotes positive transformation.